Our location at Mail Boxes Etc. Earls Court offers the perfect meeting space for your business needs. We understand that creating a welcoming and positive atmosphere helps to inspire and impress, and ensures your team has a successful and productive meeting or training session. And as it is private and not overlooked, it's ideal for holding interviews, appraisals and 'one-to-one' sessions. Fitted with WiFi, HD screen and flip chart and with tea and coffee facilities available the meeting space at Earls Court is ideal for your next board meeting, team training session, or just a quiet space for you to plan your next business initiative. Located less than a 5 minute walk from Earls Court station and within easy reach of The Olympia Exhibition Centre, the space provides an ideal location for pre or post-exhibition meetings. 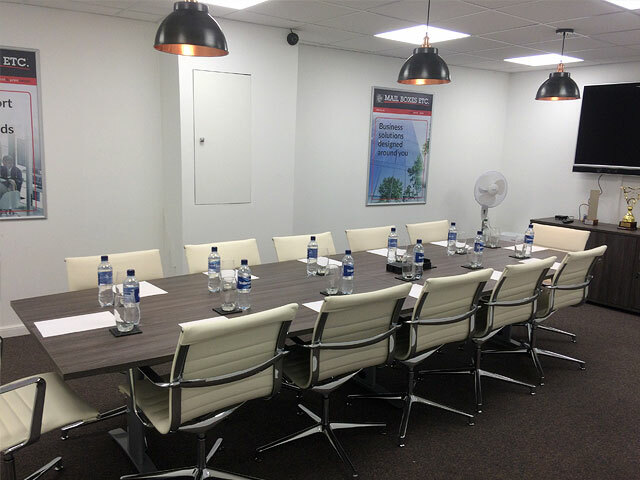 Our space is ideal if you're looking for a meeting room Paddington, or meeting room Victoria, too. Rent from £40+VAT per hour, or just £200+VAT per day. The room is available between 9am-5pm Monday-Friday and 10pm-4pm on Saturdays. Please complete the form on this page, or call us free on 0800 623 123 with your requirements.